Villa Zebra was a zonk for our kids. Jeff found it cramped, underdeveloped and boring. This small exhibition space and activity center across the Nieuwe Maas from downtown Rotterdam has loads of potential but fell flat. Tickets cost 7 EUR per person – adults pay – so a few hours at Villa Zebra can add up. The building is easy to reach just a couple of blocks from the Wilhelminaplein Metro station. It’s also walkable from the Markthal and other attractions in central Rotterdam. Villa Zebra has a small cafe serving meager kiddo snacks. Think nothing more than reheated poffertjes, tea and coffee. Unlike many museums in the Netherlands, we advise you don’t rely on the cafe for a meal. Our kids enjoyed the activities at Villa Zebra. There was a station for Legos cleverly set up with only white bricks so kids could make architectural designs. A member of the staff was happy to sit and build with our Big Little for a while. It is always beneficial for the kids to get some interaction in Dutch from other adults. There was also a theater area where kids could don costumes and act out plays, complete with sound effects. During our visit there were several ongoing craft tables. Our kids chose to make a monster craft which they cut out and glued, glued, glued. There were also a couple of tables of miscellaneous toys. I found the presentation to be a bit meager. There were a handful of toy stations but aside from the white Legos, each was just a box of toys set out. Villa Zebra felt more like a place to kill time than a destination. Sure, on a rainy day this could be a place to hide-out for a bit but I had a hard time paying 21 EUR for the three of us when there just wasn’t much thought behind the play areas. Villa Zebra doesn’t claim to be a children’s museum nor an educational space so I give them a bit of leeway, but I felt that I could put together better play stations on my own. Older children are permitted to go upstairs. I had to plead with the front desk staff to go up because our children were too little. They didn’t seem to care that I needed photos for this review but ironically there wasn’t much to photograph anyway. The upstairs area was a temporary exhibit for 7-12 year olds, titled “Deep in the Woods.” It looked no more interesting than the downstairs area catering to 3-6 year olds. Villa Zebra does host parties and events. While we were there, a child was having a birthday party. Each kid got a drink and potato chips from the snack bar and the group played together. 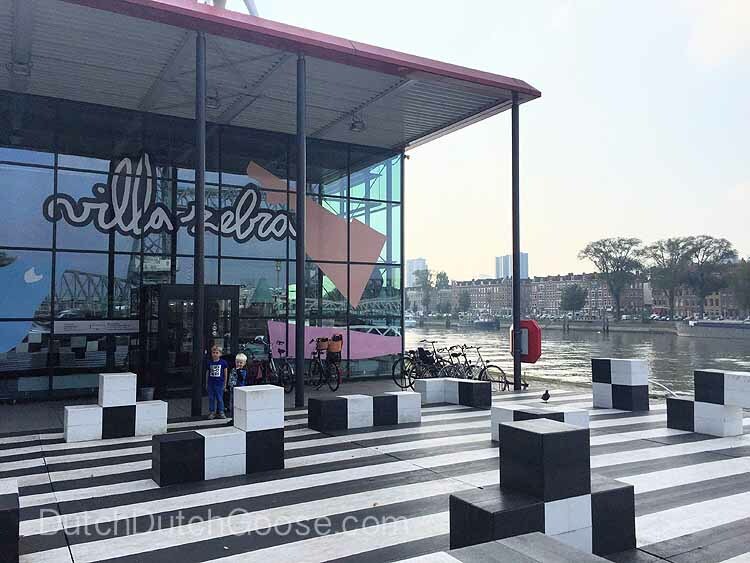 It was an easy train ride for us and we were glad to have marked it off our to do list, but with the plethora of amazing museums and children’s activities in Rotterdam, Villa Zebra didn’t meet my expectations. Nor was it a good value. Visit in a pinch or in a rainstorm but don’t waste a sunny day there.